In order to avoid damaging our environment and to preserve this planet, we recycle, drive eco-friendly cars, use eco-friendly deodorants etc. But, most of us never thought our fitness and exercises can be done in an eco-friendly manner. It’s possible to exercise in eco-friendly way and this article will list 7 ways you can do so. Americans use 2.5 million plastic bottles every hour and most of them are thrown away. In fact, only around 27% of plastic bottles are recycled. You can do more for your environment and for this planet by purchasing reusable bottles for your workouts. Instead of throwing plastic bottles away, it’s smarter and eco-friendlier to use reusable and recyclable water bottles. This is, also, more beneficial for your budget as well. Instead of spending money on new bottles all the time, reusable bottles last for a longer period of time. When you exercise you wear sneakers and they can’t last forever. Every now and then you have to purchase a new pair and the older pair ends up in the trash. Well, there is an environmentally friendly way to ditch old sneakers. You can donate them. Here, you have several options. If your sneakers aren’t completely ripped and are still wearable, you can donate them to charity. If sneakers aren’t wearable anymore, you can still donate them for other purposes. For instance, there’s a program Nike Reuse A Shoe which recycles athletic shoes into surfaces for playgrounds, tracks, basketball and tennis courts. Driving, taking a train or subway to work isn’t friendly for the environment and it’s, definitely, not friendly for your budget either. 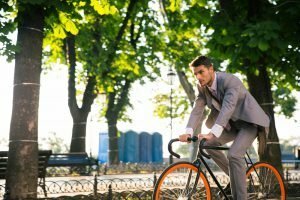 You can take the opportunity to start your morning with exercise while going to work. You can walk to work and alternate between faster and slower pace or you can ride your bike. This is eco-friendly fitness tip that will help you get into perfect shape while caring for environment and your budget, all at the same time. It’s impossible to exercise in an eco-friendly way without buying eco-friendly clothes. Luckily, you can now find many clothing options in retail stores and on the internet. For example, you can purchase sports bras such as Moving Fit Vixen which is made of recycled coffee grounds. Other eco-friendly fitness clothes brands include Lululemon which is well-known for comfortable and stylish clothes made bearing the environment in mind. Also, REI manufactures their clothes from organic, recycled, and reusable materials. You can also conduct a little research and find eco-friendly stores in your neighborhood and buy your fitness gear there. Do you practice yoga? Do you use “standard” yoga mats that are made of potentially harmful materials? If that’s the case, you can easily change that and pick a safer option for you and the environment by purchasing eco-friendly yoga mats. These mats are made out of sustainable materials such as natural tree rubber. There are numerous eco-friendly yoga mats on the market and some companies also give back to society e.g. planting a tree for every sold yoga mat, donating to ovarian cancer research etc. Instead of standard towels which aren’t made of eco-friendly materials and tend to be too rough for your skin, you can opt for eco-friendly alternatives. For example, you can buy towels made from organic cotton, bamboo, and hemp. Treadmills and stationary bikes will, soon, become ancient history. Why? It’s because new inventions are going to take their place. These new inventions are eco-friendly because they generate their own electricity. For instance, the visCycle from Research Fitness converts the energy from your workout into electricity that feeds back into the power grid. We owe it to our planet to be more conscious in order to protect it. Regardless what we do, we should bear in mind that all our actions have a direct impact on the environment and our job is to make it positive rather than negative. Going green and opting for eco-friendly options applies to fitness as well. Is it Worth Spending $30 on a Jar of Honey? Ella James is an aspiring author who is pursuing Health Services Administration degree from St. Petersburg College. She is an active contributor to Consumer Health Digest. Her interests include reading and writing about Health, Fitness, and wellness information. Get connected with her on Facebook and Twitter. Guest Blog: 3 tips to stay hydrated without even tryingWhat is Fascia? And How it Impacts Cellulite, Tightness and Injuries.